This is well equipped, high end accommodation. A place for those who's time out and creature comforts are important to them. The kitchen, dining area and living room are open plan, allowing a feeling of space where you can enjoy your complimentary bottle of wine. You are on holiday after all! The large bathroom has both a bath and seperate shower. You will find a selection of toiletries by Aaran Aromatics, a local boutique company. Feel free to take the "minature" bottles home with you. 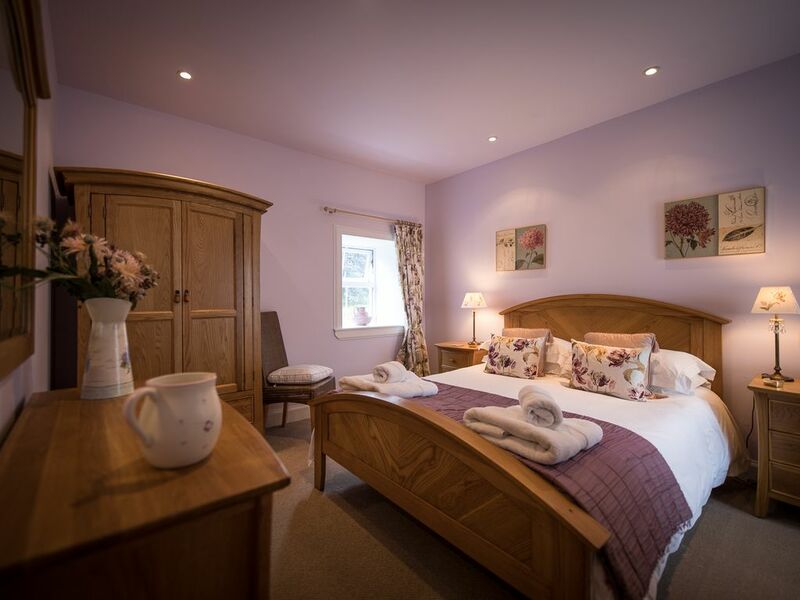 A kingsize bed awaits you in the relaxing bedroom, furnished with solid light oak drawers, bedside tables and wardrobe where you will find a toweling robe each.
" The decor was modern and reflected the location, it was so nice in comparisson to other cottages we had stayed in. I felt I was staying in someone's home." "Well equipped and furnished beautifully"
"We spent everyday out while late walking and climbing but no matter how wet or windy it got, the knowledge we had a real home from home to come back to was a genuine comfort"
" A great base for exploring the island"
"My wife struggles to sleep in strange beds, but the mattress here was a delight and the bedding fantastically clean"
"The huge bathroom was fantastic and the shower really hot and powerful, essential after a long day"
We would be delighted to welcome you here. Perfect cozy place to rest up! The cottage was well equipped and really cozy! The property was really gorgeous. Thanks so much for your feedback. It is great to hear that we are delivering the experience that we wish to deliver.